I got into the car and chewed out my daughter. My daughter who had yelled at me when I told her we would be late for HER practice. When I got into the car, I gave her a nice talking to about how she WILL respect me or I will NOT be taking her to her practices, buying her school stuff, and bringing her lunches when she forgets. I am not her maid, her chauffeur, her cook, and I am most definitely not her servant, and she will not treat me as such. As we rode along in silence, I turned on the radio. And who should I hear, but Whitney in all her 80’s glory singing…. Ok. I can take a hint. Thank you. Last week I got a present in the mail. The One2One Network sent me my own copy of Idina Menzel’s CD to listen to, enjoy, and review. I wanted to quickly pop it in and listen to it, and tried my computer first. Thanks to my son, my speakers were not hooked up, and not wanting to worry about wires and things, I went to go find another CD player that worked. Not an easy task. Really. I finally ended up in my daughter’s room playing this CD in her little boom box while I measured and taped in her room–kind of a prep for painting thing. I was quickly impressed by Idina’s voice, and loved the first four songs. 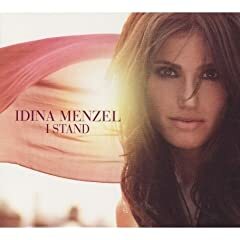 **I stand- is a powerful song from a powerful woman. It’s got an inspirational message. **Better to have loved- Also a great song. When my daughter was listening to it with me, I said, “do you know who this is singing this song?” She thought for a minute, and said, “Someone from wicked, I think.” She thought for a minute more and correctly identified that it was Elphaba. That’s what comes from listening to Wicked over and over on her mp3 player, I guess. **Brave- By far my favorite song on the whole album. “I might be afraid but it’s my turn to be brave” is a great message, and a good reminder not to give up during hard times. **Gorgeous- I’m all about the singing along to a song, and this one has a catchy chorus and is very fun to sing. With her clear-cut voice and direct lyrics, Menzel really sounds like sheâ€™s singing truthfully. She’s got such an amazingly powerful voice, and could really sing just about anything. But I get tired of the same sound for the entire time. Maybe that’s why by the end of the CD I wasn’t as jazzed about the songs. The last three songs on the CD seemed to be the edgy, downer songs. They seemed so angry and negative. While they may be great songs, I personally didn’t care for them. I need songs that are going to keep me upbeat and happy, not make me depressed. Overall, I would give this album 3 1/2 out of 5 stars. It’s one I’m going to keep in the car and probably listen to quite often. If you are a fan of hers, you are going to want to check it out and take a listen. Because I’m cerain there must be just tons of you out there suffering from vericose veins just like me (I think I may here the crickets chirping right now), I figured I would document my whole vein experience, and then maybe this whole journey might be helpful to someone else. Today I went in for a “vein mapping” and a consultation. I was scheduled for an hour and a half appointment, which really means two plus hours in doctor speak, so I planned accordingly. It turned out to be the worst possible day to flit off to Provo for an appointment, since it’s early out day at school, and that meant a whole bucket load of arranging, but it worked out ok. I filled out the paperwork ahead of time, which was great. I think all doctors should let you download and print the forms, then you are all prepared and it saves you that “coming in 15- 20 minutes early”. Of course, I had to wait in the waiting room 1/2 hour anyway, so I could have filled out the forms them. But the questions asked all about my leg pain standing, sitting, walking, etc. It said to not fill it out according to how the pain is now, but at it’s worst. Since this is a form that’s going to our insurance, I tried not to be noble about the level of my pain. When I finally went back to the exam room, the tech gave me my lovely gown and my even lovelier “disposable underwear”. Oh, my gosh, but those underwear could be a blog post all on their own. Let’s just say that it’ll hopefully be my only experience with wearing a thong. Ick. After taking pictures of my legs (oh, how mortifying! ), the ultrasound tech came in, and she did a bunch of ultrasound and measuring of my right leg. Even though I have some weird veins on my left leg, my right leg is the main problem right now, and since I was trying to keep the initial cost down until I know what’s going on, I only had them work up the right leg. I asked her about the new purple bump that’s been bothering me for the past three weeks, and she affirmed that yes, it is a blood clot, but since it’s a superficial vein, it’s not the scary, kill you or give you a stroke kind of blood clot. She put some fun little marker marks on my legs and measured between them, and “mapped” my bad veins. After she was done, she took me into another exam room with a nice flat screen tv on the wall, and said I had to watch a little video presentation about what they do to these veins. Even though they didn’t show proceedures on actual veins, I was getting grossed out and queasy. I mean, when they start throwing around terms like ‘ambulatory phlebectomy’ and ‘sclerotherapy injections’, I don’t know about you, but I pretty much need to lean over and put my head between my knees. Luckily, they had left me in the room by myself to witness the animated vein carnage, so I was able to piddle around a bit and not really listen or watch. “Oh, look, they have Eucerin lotion over there!” I thought, “Since I’m sitting here 1/2 naked in a gown, this is the perfect time to lotion up!” So, I did some lotion slathering. Then I tried to read a bit from my book, but who can concentrate on a book when someone’s blabbering on about compression stockings. I know, I’ll call my husband. Not there. Darn. Who else can I call from this exam room? I can’t get into too much of a conversation, because what if someone walks in and I’m not watching my assigned film. It would be like in high school when the drivers ed/health teacher leaves you alone to watch some kind of movie titled “Clamidia and You” and you are supposed to take notes but everyone ends up just talking. Ok, not really. I don’t think we watched any movies about STD’s in high school, did we? But we did watch those gross out wear your seat belt OR ELSE movies. But I digress. Once the little explaination film with the perky lady was over, I opened up the door to let them know I was finished, and then waited for the Nurse Practitioner to come in. At this point, it’s been one and a half hours since I got there, and I’m starting to get hungry. I start to rifle around in my purse to find some kind of snack to help ease the quesiness, and wait some more. After a few minutes a big guy came in. I think his name was Kelly. He went over my charts and let me know that in just my right leg, I had three “serious” veins (my ‘greater sapheous vein’, ‘anterior lateral tributary’, and my ‘small saphenous vein’, if you must know. And if you think I’m just throwing those terms around, being the vein expert that I am, you would be wrong. I’m reading right off of the paper!) and explained quite well what the preferred course of treatment would be. So as not to TOTALLY bore you to death, I won’t go into all the glorified detail. Let’s just say they would do something called an ‘endovenous ablation laser therapy (EVLT) on those three veins, and then a couple of other things to some of those littler veins, and about here was when I kind of lost my concentration a little bit. Oh, look, something shiny! What were you saying? Oh, yes, let’s get down to the COST and does my insurance cover this whole vein party that you are planning for me? The good news is that once we reach our ginormous deductible, our insurance will cover MOST of this at 100%. And we are not talking about cheap little procedures, here, folks. Each of these EVLT’s are billed at around $3900, and I’ve got at least three of them. Then there’s some other stuff called AP (ambulatory phlebectomy if you must know) that I don’t even want to talk about that are billed by the number of incisions that are made. Eek, I’m getting grossed out again just reading the paper, so I’ll skip over the rest. So, for this whole package (and this is one leg, mind you) it’s somewhere in the 12-20 thousand range. Wow! The bad news is that we have a $3000 deductible, and counting today’s payment, we’ve only met about $600 of that deductible this year. Since they recommend that you do one vein, then wait a few weeks to heal, and then do another vein, (lather, rinse repeat), you need a good amount of time to do all of this. That is, unless you want to have it done all at once and then be in severe pain while it heals. With concerts coming up in a just a couple of short months, I think I’ll wait until the beginning of the year. Then I’ll have a whole year to do as MUCH as I can. I mean, once the deductible is met, I might as well, right? If you are still with me here, congratulations. This is a lot of medical mumbo jumbo and it gets pretty boring and long, so I can understand if you’ve nodded off. You deserve treats. In summary, Yes, they can help me, and yes, it’s going to be expensive. Thank goodness we have a health savings account for just such expenditures, and then insurance to cover the rest. But we’ll have to wait until the beginning of the year to start, so that I can get the very most for the money. And hopefully we won’t have any more talk about veins until then. Ok? Ok. However, when I mentioned my vericose vein/blood clot issues, they all promptly chewed me out for not going to a doctor. (I did talk to a doctor, folks, I just didn’t have the whole ultrasound/consult experience) I think the word “clot” scares people and they immediately think of stroke, paralysis or death. They berated me for my casual attitude and insisted that I go to a doctor immediately. Well, being the phychosomatic symptom sufferer that I am, I started feeling some weird tingliness and some leg pain on the way home. By the time I went to bed, I had talked myself into a near panic. And this isn’t even consulting Dr. Google. When Ryan came to bed a couple of hours later, I still couldn’t sleep, since I was wondering how long it would take him to notice if I had a stroke in my sleep, and if he’d get me to the hospital in time for TPA treatment, and all that stuff. And remember that ER episode with Cynthia Nixon where she has a stroke and then can’t communicate and wonders what’s going on and all that panic? Well, I do, and I couldn’t get it out of my mind. I eventually did get to sleep, but this morning, the first thing I did was look up vein treatment centers and stuff like that. I found one that says they take my insurance (after my huge deductible, of course), that does an ultrasound of the veins FIRST, so I can see if I have deep vein clots, or just the surface clots that are bothering me, and they can take me on Monday. So, there. I can rest easier knowing I have an appointment, at least, and then I can find out how unbelievably expensive this will be to get these things treated, and what they can do to ease my pain. And, for you trivia buffs, what movie tells it’s main character to “Ease his pain”? Bonus blogging points for the correct answer. I’m having a discouraged day. Don’t fret, these happen every so often. I usually get over it eventually, once I find a way through the cloudyness that fogs my brain and my soul. But right now I feel very weighted down. My children fight over every little thing, and nothing I do is right, or good enough, or soon enough. I didn’t buy the band book that my daughter needed TODAY, and I didn’t find the band book that I bought last year for my son. I didn’t go to the soccer game last night to support my son. I didn’t let my daughter play with a friend. I didn’t make the right thing for dinner. And the list goes on. Meanwhile, the dishwasher doesn’t seem to be working. All the dishes come out with, well, with bits of food still on them. My washing machine isn’t agitating. Maybe I should have my kids work on that one, since they seem to have the agitating thing down to a science. My air conditioner isn’t keeping up with the heat, and even though we have nice cool mornings and I don’t even start the air until the afternoon, by 5:00 it’s 85 degrees in the house and I find myself very grumpy. I could call a repair man, but I am just sick at the amount of money that will cost. I’ve spent so much money lately, I just don’t know how we’re ever going to save up for the things we are trying to save for. So I do nothing. My kids’ rooms and my room are disaster areas. Oh, let’s just be honest and admit that the whole house is a huge mess, shall we? I have these grand dreams of projects that involve painting and taping and curtain sewing and rearranging, but whenever I walk into that area to get started, I just look at the mountain that is before me and I can’t summon up the energy to even start. Or I get sidetracked because I can’t find a tape measure. Or my sewing scissors. Even just cleaning up the boys’ room seems an overwhelming task to me right now. So I avoid those areas and try to read a book. When there’s a bunch of bananas going brown on my counter, I decide to make banana bread. But it turns out kind of mushy and not quite right. Plus, I tried a “fancy” cranberry orange banana bread, and it seems people around here prefer the normal “Plain” kind of banana bread. I got a box of apricots from my in-laws so we could make some apricot jam. We love apricot jam. I even got some jars and pectin. But I let the apricots go bad waiting for me to do something with them. The thought of the mess that would make was overwhelming to me and I just let them rot. My husband must have gotten tired of seeing them sitting there in the box, and he threw them away for me. So, at least I don’t have to look at the box of wasted fruit reminding me that I failed. I have a lesson to prepare, as I teach the young women on Sunday. I haven’t looked at it yet. We also need to plan an activity for the girls to do on Tuesday. How about we come and clean my sons’ room? Or clean out my basement or paint my daughter’s room? Could we count that as service? Well, I would never let them come and see the state of my basement, my sons’ room or daughter’s room, so that’s pretty much out. I never see my husband, as I’ve had places to go every night shortly after he gets home. And it seems when I do see him, I’m just irritated by every little thing, and so we have nothing to talk about. I would ask for help if I knew what I needed. I’m trying not to be stuck in my feel sorry for myself funk. I’m out there being busy, really I am. Yesterday I loaded John up in the jogger stroller and we went for a two mile walk. We stopped at a park and he “played” while I “jogged” (using the term very loosely, my friends) around the track. We’re trying to enjoy the simple joys of life. The day before that we went to yoga. But today I just can’t make myself do either of those. I will get up. I will turn off the computer. I will take a shower and get dressed. I will clean my kitchen. I will run my dishwasher again and hope it will work a bit better. I will fold some laundry. I will vacuum. I will go and buy the band book and the new piano books and try to find the other band book for my kids. Maybe I’ll even get them to them at school by the time they have those classes. I will continue doing what I know I need to be doing. Maybe doing these things and putting my house in order just a little bit will help me find some order in myself. Oh to be young and to have your biggest worry be if your cool tatoos that your mom just helped you plaster on your arms will show if you wear the long sleeved shirt you picked out. Mom suggests a short sleeve shirt, but you’ll have nothing of it. But you do accept rolling up the sleeves. Oh to be young and the most strenuous job your mom makes you do is put away your shin guards and cool new soccer shoes. Wow, today is our anniversary. 16 years, that’s a lot. I’m excited about that! I’m so thrilled to be happily married to my dear husband after all these years. It’s also the first day of school. I’m really excited about that. I wouldn’t have been excited had the kids not been fighting like cats and dogs for the past couple of weeks. But, since they have to go to school, I’ll just have to live with it. Of course, they’re not all gone. Megan had her 7th grade day on Friday, so she gets today off, and John doesn’t go to school this year, just preschool again, so he’ll be here with me. But I hope the other three have a nice first day. We had our traditional “back to school breakfast” this morning at the bus stop, and even though it was chilly at 7:15, it was fun. My, oh my this back to school thing is getting expensive. Between the fees ($280 for two kids in Jr. High), the supplies ($100 buck for a TI-85 graphing calculator? Cough, cough, choke! ), the paper, pencils, notebooks, backpacks, markers, pencil sharpeners, scissors, pencil boxes, dividers, pens, etc. ($100 at least! ), then there’s the clothes and shoes, where we plunk down another couple of hundred there, and that’s outfitting them on the cheap! And today I wrote out four checks for a month of lunches, since they tend to make lunches and then leave them in the fridge (like today), and need to have money in their accounts to buy lunches a couple of days a week, so there goes another $140. Then there’s the extra things like PTA, band at school, and the “$10 donation” for each class, and I’m up to a cool thousand out of pocket to get these kids back to school (and that’s not even counting the $700-$800 for marching band, which thankfully does several fundraisers and we’ll only end up having to pay about 1/2 of that out of our pocket, or the fees for soccer, dance or choir)! I need a “back to school bonus”, that’s for sure. I’ll just try not to think about it. So, moving on to happier things, I have consulted Random.org and have picked a winner for our little Idina Menzel contest. Thanks to all of you who entered, and I wish you could all receive her wonderful CD, but our lucky winner is Jeanine from Ramblings from a stay at home mom is our winner today. Congratulations. Well, I’ve got to go and enjoy the quiet. Maybe get something done today–who knows. Oh my Goodness, my little girl starts junior high today!! How can Megan be that old? How can I be that old? She seems pretty calm about things, although last night when we went to back to school night at the school, her locker is the one that WON’T OPEN. Her friend’s mom had both hands on that stupid “latch/turny thing” and couldn’t open it. We ended up with the assistant principal over there helping her, and he was very nice and said that if she couldn’t get it working after a couple of days, to come and see him and they would swap it and get her a new locker. EEK. Then we tried to pick out something to wear for her first day, and she was amazed that I wasn’t going to let her wear the ratty boys shorts that she’s been wearing all summer. Huh? If you don’t want to go shopping with me to pick out your school clothes, you get to wear what I pick. Jeans were just “TOO HOT” in her opinion, but I found some cute sporty capri pants that I had bought for Natalie, I think. She’s wearing those, a new white t-shirt, and her new track shoes. Still sporty, but not scroungy sporty. Natalie went and picked out her new glasses yesterday. Yes, after her eye appointment, she is now going to be a glasses wearing kid. She’s excited about the cute green glasses she chose, and I was relieved that they were only about $106. And for Nastia and Shawn–YES!!!!!! I stayed up way too late to see the Women’s all around, since our tivo has been stopping at 11:30, then I never see the end. Ryan even said he was recording it, but I got sucked into the event, and couldn’t turn it off. I was really rooting for Shawn Johnson (isn’t she the cutest girl? ), but I’m happy with how it ended up. I’m AMAZED and ASTOUNDED at what these girls can do,and so glad they won, even with the unfair scoring. Didn’t you think the scoring was unfair? Especially on the beam. What’s up with that, China? Yesterday at Costco I saw 5 or 6 guys all standing around the checkout counter. They were all in work clothes, and one of them had some landscaping logo on his shirt, so I assumed they were all landscapers. They had no cart, but one of them was carrying a Kitchenaid mixer. They paid for their mixer, and since I was right behind them in line, I couldn’t resist asking them what they were all going to do with that mixer. “We’re going to mix up some concrete!” said the older guy, who was probably the boss. But he was laughing, so I couldn’t tell if he was serious or joking. He just laughed and they walked away. It’s back to school time for us. That means we are buying notebooks and pencils and backpacks, also making sure everyone has shoes and clothes that fit. Then we get to go to the “Back to school nights”s and Open houses and get everyone excited to go back to school. I’ve kind of been lamenting the fact that the summer is coming to a close and we haven’t done many of the things I’ve wanted to do. We didn’t go on any kind of a vacation, not even in state. We haven’t gone to Lagoon, even though I won one season passport for one of the kids. We haven’t gone to St. George or Park City or even Logan. The farthest away we’ve gone as a family was Syracuse, for heaven’s sake. But as my kids were driving me crazy with their incessant fighting and teasing, I told them I didn’t have the money or the inclination to take them anywhere else fun. They needed to find something to do AT HOME and use their creativity instead of just watching tv. I began to realize that Yes, we have done a lot this summer. Just maybe not all together. I mean, we have been awfully busy. What Have we done this summer? So, I put together a little list. It’s not all inclusive, and not every kid did everything on the list (John obviously didn’t go to girls camp, you know). But it’s a good reminder of all the fun we’ve had this summer. So, if you look at it like that, we’ve all had a pretty darn busy summer! And I need to stop feeling guilty that I didn’t win a trip and take my kids to Disneyland this year. Maybe I should print this out and give it to the kids when they go back to school. Just so they won’t forget. Or I could send them here to look at all the fun pictures we’ve taken of our summer adventures. And in a TOTALLY unrelated light, do you think a Happenings Book would be a tacky gift for a wedding shower? I mean, they will be newlyweds, and they’ll need coupons, right? And by buying them, I would be supporting my son in his fundraising needs. Why not kill two birds with one stone, if you know what I mean? What do you think? Too tacky? Not tacky? Or just tacky enough?